Chuck LaChiusa discusses the furniture and architecture of Buffalo, NY, especially late 19th and early 20th Century styles like Arts and Crafts, Colonial Revival, Eastlake Victorian, Beaux Arts, and early modern. Based in Buffalo, Chuck can be reached through his website, Buffalo Architecture and History, which is a member of our Hall of Fame. About 11 years ago, my wife and I went on some architectural tours. We joined the organization that sponsored the tours, and I volunteered to be the Webmaster for them. I decided to take a few photographs to illustrate the tours, and realized it would also be good to describe some of the architecture, so I started an architectural dictionary. Then I decided it would be useful to have some Buffalo history, as background for the architecture, so I started working on that. Then I started photographing the interiors of buildings, and sometimes that would include furniture. I had always loved antique furniture. Three years ago, I decided to focus on furniture, and spent all of my spare time for about a year doing research about furniture. I bought dozens of books to identify the photographs I took. What I developed in that year is on the website. Collectors Weekly: What era do you focus on? LaChiusa: My focus is Buffalo. So if I go to France or Italy, I’m looking for buildings or furniture that are prototypes for what I find in Buffalo. And I look in museums, not only in Europe but throughout the U.S. So if I’m showing a building in Buffalo, I can refer to some building or museum in Paris or Geneva that has similar furniture. In a city like Buffalo you find furniture from all ages, but generally starting in the 18th Century. There are a lot of European influences. France, England, and Germany are the countries I’ve seen most in Buffalo furniture. Outside of Oak Park, Illinois, Buffalo has more Frank Lloyd Wright architecture than any other place in the world. We were in London recently and went to The Victoria and Albert Museum, and lo and behold, there’s a Frank Lloyd Wright section with a chair there from a building in Buffalo, the Larkin administration building. So there I am in London, photographing a piece of furniture I hadn’t seen in Buffalo. 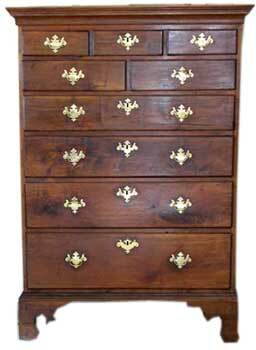 Some of the main styles I come across are 18th Century styles, like Queen Anne, which is pretty popular among collectors; Chippendale; and Federal Style. A lot of older people, for example, have Federal Style or Colonial Revival furniture. Empire is pretty popular, and of course, Buffalo’s strength in architecture is Victorian and early 20th Century. A lot of the Victorian homes have Victorian Style furniture, so I see a lot of that. And Rococo Revival. The basic 19th Century styles, those are the most popular. Collectors Weekly: How much crossover is there between the furniture and the architecture? LaChiusa: Quite a bit. When I started the furniture glossary, I was amazed at the number of terms that were common across the two. Furniture is almost like a smaller version of the architecture. The same kind of ornamentation. 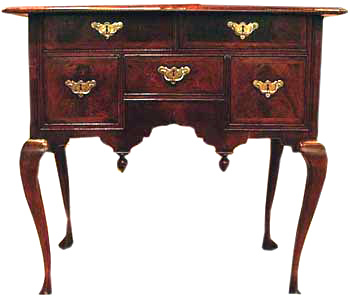 An Eastlake building and Eastlake furniture have the same angularity, the same heaviness, the same style of turning. Art Deco architecture and furniture is geometric and simplified. The fun part for me has been finding those connections. I’ve always been amazed there aren’t better books that focus on periods in terms of both architecture and furniture. People who are interested in architecture are interested in furniture and vice versa. Collectors Weekly: Did the designers tend to do both? LaChiusa: In some cases, the architects and the designers were the same person. The Adam brothers in Scotland and England, they would do the whole deal for you – the architecture and the furniture. Frank Lloyd Wright went so far as to sometimes even designing clothing for the lady of the house. There are stories where Frank Lloyd Wright would, years after the house was finished, show up out of the blue and start moving the furniture he had designed because he wanted them in specific spots in the room. He’d be angry if they’d been moved. Another crossover example from Buffalo is Kleinhans Music Hall, which was designed by the Saarinen father and son team. The son, Eero Saarinen, was a famous architect and also a furniture designer. He designed the St. Louis Arch and the TWA airplane terminal in New York City, but was also well known for his furniture design. Kleinhans Hall has furniture that the son designed for the building. That kind of find is really exciting for me. Architects aside, some of the big names in furniture design that show up in Buffalo include the 20th Century designers like Mies van der Rohe. His Barcelona chairs are still being manufactured. One of Buffalo’s last significant buildings is a bank building downtown, and it has Barcelona chairs. I really like those. Van der Rohe started off in Europe and came to the United States when Hitler came to power. He’s the one who popularized the international style in the United States. 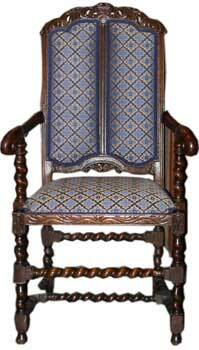 Collectors Weekly: What about Arts and Crafts style furniture? LaChiusa: The Arts and Crafts style was very popular in Buffalo. There are a handful of people who popularized this style in the United States. In the Midwest, you had Frank Lloyd Wright. In the far west it was the Greene brothers, and in the eastern part of the country, there were two important influences. Elbert Hubbard opened up in a Buffalo suburb, East Aurora, and started the Roycroft movement. The Roycroft community is a major tourist draw in the Buffalo area, and in fact furniture was made in the Roycroft shops in East Aurora. 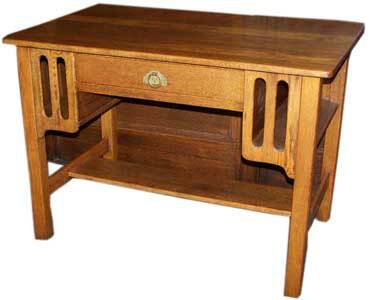 Arts and Crafts furniture is referred to as Mission Oak style. And it is readily found in Buffalo because of Roycroft. It’s very popular to collect today, especially among middle-aged people in their 40s. Oak has become popular. I remember when my wife and I were collecting years ago nobody wanted Oak. Everybody turned their nose up then. They were collecting Colonial Revival then, but Arts and Crafts is in today. That shift probably happened because the Colonial Revival furniture just ran out. 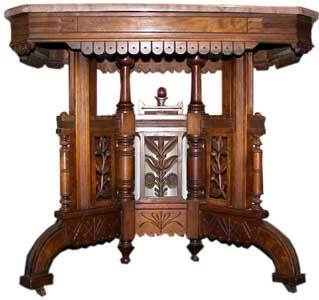 The Arts and Crafts movement originated in England towards the end of the 19th Century. It was a reaction to the Industrial Revolution and machines. It was about going back to handcraft, back to the craftsmanship of the Middle Ages. It came to England earlier because the Industrial Revolution started there earlier. In the U.S. it was after the Civil War that we had our industrialization and the corresponding reaction. People like Elbert Hubbard went to England and were influenced by William Morris, the most important Arts and Crafts figure. It really caught on in the U.S. around the turn of the century. There are sub-styles of Arts and Crafts architecture too, like bungalow, and even prairie style. And people buy the furniture that corresponds to the architecture. In the early 20th Century, when the cities started expanding into suburbs, the most important styles were Colonial Revival and Tudor. So people bought Colonial Revival and Tudor furniture. Even today, if you live in a Colonial Revival, you’re probably not going to get Art Deco furniture. There’s also a strong correspondence between architecture, furniture and clothing. That’s something you’d expect to find more books on, but you don’t. Collectors Weekly: What were some other popular furniture movements in America? LaChiusa: French influence was very important in the early 19th Century. After the French Revolution, wealthy French nobility came to the United States, bringing with them their clothing, furniture, styles and ideas about architecture. Because they had money, they influenced American design and architecture. So you have French furniture and architecture, Rococo Style and later Rococo Revival. In the 19th Century you had these revivals of European style, and there was some reaction to that at the beginning of the 20th Century. Some architects felt we shouldn’t just be imitating European styles. We shouldn’t be using the Greek and Roman ornamentation. People like Louis Sullivan said our ornamentation should be more natural, and you had similar thinking in philosophy and in literature.You also had people who were looking toward the beginning of our country. But Colonial style was really just English-style architecture. Its really not as American as people would like to think. Skyscrapers were probably the first manifestation of an American architecture. And what preceded the skyscrapers were grain elevators. That’s something I’m really interested in because Buffalo has probably the largest number of grain elevators anywhere in the world. These huge grain elevators were actually built in a couple of weeks. They came up with ingenious technology. In fact Europeans would come to Buffalo, architects would come to Buffalo to look at these monstrous elevators. They influenced people’s thinking about the height of buildings and eventually led to the skyscrapers. This was at the turn of the century. Collectors Weekly: What’s up with all the revivals? LaChiusa: Revival just meant that the earlier European styles became popular again. 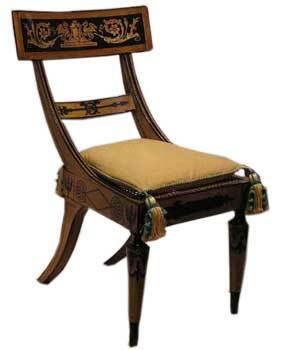 For example in the 18th Century, you had Queen Anne Style and Chippendale Style in England. Later in the United States, you have Colonial Revival, and a lot of that is in Queen Anne. Queen Anne and Chippendale are actually European Rococo Style. As a young man, I liked Victorian, the Rococo Revival. Those were the first pieces that my wife and I bought. Later I remarried, and my wife’s family had grown up in France and she introduced me to the country. Most of the stuff we have now is country, some of which comes from the family but some we bought. Because we like country furniture, a lot of our furniture is made out of Maple. But there’s very little market for that anymore. Another current style trend relates to size. Larger pieces are harder to sell these days because we’re a much more mobile society, with people moving from one city to another for work. It’s difficult to transfer large pieces of furniture, so they’ve lost some of their value. I still love the Victorian stuff, and I’ve become enamored with some modern furniture. I’ve always wanted to buy, for example, a Barcelona chair, although my wife hates modern so I never did. I think in your life you go through stages where different styles appeal to you. One interesting phenomenon which is happening now is that buildings from the 1950s are now eligible for listing on the National Register. So older people who are interested in architecture and all their lives mocked suburban-style buildings are now in the process of helping to put them on the National Register. Things change. Collectors Weekly: Have you met a lot of antique furniture collectors in the course of your research? LaChiusa: I think the people who own antiques are primarily people with family heirlooms that they love. That’s the typical way people get started collecting. They’ve been given some family heirlooms they like and decide they want more. In terms of people who use my glossary, they’re from all around the world. The website gets about three million hits a month. Collectors Weekly: What’s unique about Buffalo Architecture? LaChiusa: We’re becoming nationally known for our late Victorian and early modern architecture. Compared to other cities, we lost relatively little to urban renewal because in the 1950s and the ‘60s Buffalo was having an economic downturn. Today there’s a very different attitude toward these late 19th Century and early 20th Century buildings and their furniture. Even though Buffalo as a whole is losing population due to factory closings, there’s still an influx of young people coming in because they’re attracted to the old buildings, which are relatively inexpensive. It’s easy to find cheap office space in an old building that can be rehabbed. A lot of our old buildings downtown are being turned into lofts. That’s happening throughout the country, but it’s really just taking off in Buffalo. What’s neat about architecture is that the styles really were national. What I find in Buffalo, I can see in many other cities also. But people are also traveling as tourists to other cities to see 19th Century architecture. And of course in some cities, there’s even 18th Century architecture. So for that you go to Boston or to New York. Buffalo has great late 19th to early 20th architecture. And outside of Buffalo, we have these cobblestone houses, which use these native, symmetrically placed fieldstones. Those are pretty unique. But aside from that, Buffalo was just hiring Chicago and New York architects. The big three American architects are H.H. Richardson, Louis Sullivan and Frank Lloyd Wright, and Buffalo had signature pieces by all of them. We have a very early H.H. Richardson house. His largest project was the New York Insane Asylum, now called Richardson Complex. And we have what’s probably Sullivan’s most beautiful skyscraper, the Guaranty Building. We have Frank Lloyd Wright’s most beautiful prairie house, the Darwin Martin house, which is now a museum. We have other famous architects also – for example, a church by Richard Upjohn, which I think is considered his finest. We also have some Beaux-Arts buildings, none of which are famous but a number of them are in good shape, and visitors find them delightful. Beaux-Arts was intended to impress in terms of size and grandeur, and it still works. There’s a wow factor there. One of our Beaux-Arts buildings, for example, looks like white Marble although it’s really Terracotta. Buffalo has an exceptional collection of Terracotta buildings. Some are uncolored and unglazed like the Guaranty Building, but we have a large number of colored glazed Terracotta, including polychromatic Terracotta. Some of the country’s best experts are just wowed by our Terracotta. Terracotta is a type of material, basically really expensive bricks in many shapes that you need a large enough kiln to bake. Collectors Weekly: Is there anything else that you’d like to mention? LaChiusa: Just that I feel very fortunate to have learned about the Internet when it was becoming popular. Being able to post this stuff and have it serve as a way for other people to learn is amazing to me. If I had been born 20 years earlier, this would have not been an opportunity. Basically I’m a teacher, and it proves to be an incredible teaching tool. It’s been a lot of fun, and it’s brought an incredible amount of pleasure and satisfaction. I also do guided tours of Buffalo, and since I retired six years ago, I give a lot of talks. In fact I’m giving a talk tonight to the kids of the local history society on Victorian Style architecture and furniture. The people who come on the tours are a good 50 percent out-of-towners. People say, “I’ve seen the buildings on your website, and I’m coming to Buffalo to see them in person.” As much as you’d like your native population to go on tours, you depend on people from out of the city because they have an interest in architecture and they see Buffalo through different eyes. It influences the way I see Buffalo too. I look at architecture as another art form. Collectors Weekly: Thanks for talking with us, Chuck! I reread the interview this morning. I was struck again on how well the interview flows. Your questions were excellent. Excellent article! Hi Chuck! M. Bogner sent me this way. While I’m sorry to hear that you have left the classroom (lots of great memories from CHS!) I am glad to be able to continue learning from you via the internet on such a fantastic topic. Not sure if it is quite “antique” enough, but do you know anything about Duncan Fife furniture? Do you think you have heard of this , or find something out about it , or tell me were I can go to find out information on it . I have what I think is an antique sheet music cabinet. Label on the back states that it was made by Larkin Co./Larkin Furniture Co., Buffalo, NY (perhaps Factory #19). Bottom shelf on right has the #s 3 over 86 on right hand side. Can you furhter identify the piece for me and is it worth having appraisal. This piece has been in my family since perhaps 1930s (?). Hi, can you tell me where to research the correct style of squab cushion for a pair of black painted Baltimore caned side chairs? Are tassels used, how are they secured. I have learned that they are only used in the winter months. I had no idea that you were giving Buffalo architecture tours, but happened to be looking for one! When in Buffalo again I will check the schedule and book. All the best and great interview! “ ” In actuality, zoning was a device to keep poor people and obnoxious industries out of affluent areas.